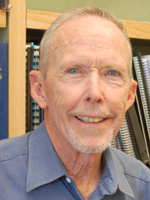 David Whitten has had a long career in academia at the University of North Carolina (Chapel Hill), the University of Rochester and the University of New Mexico. He also spent more than 2 years at Los Alamos before starting a company (QTL Biosystems) with a colleague from Los Alamos. His research is currently focused on conjugated polyelectrolytes and their counterpart small oligomers as antimicrobials and a basis for fluorescent sensors. He continues to study photochemical and photophysical properties of these compounds and materials, a career long aspect of his work. 2016, Distinguished Professor, Chemical & Biological Engineering and Department of Chemistry • University of New Mexico, Albuquerque, NM. 2005 - Present: Co-Director, Center for Biomedical Engineering • University of New Mexico, Albuquerque, NM. 2005 - 2016: Professor, Department of Chemical & Nuclear Engineering and Department of Chemistry • University of New Mexico, Albuquerque, NM. 2000 - 2004: Professor, Chemistry and Biochemistry • Arizona State University, Tempe, AZ. 2000 - 2005: Cofounder and Chief Technical Officer, QTL Biosystems, LLC. 1995-97: Chair, Department of Chemistry • University of Rochester, Rochester, NY. 1995-97: Technical Staff Member, Los Alamos National Laboratory. 1989-95: Director, NSF Center for Photoinduced Charge Transfer• University of Rochester, Rochester, NY. 1988-91: Chair, Department of Chemistry • University of Rochester, Rochester, NY. 1983-97: C. E. Kenneth Mees Professor • University of Rochester, Rochester, NY. 1980-83: M. A. Smith Professor • University of North Carolina. 1975-76: Vice Chairman, Department of Chemistry •University of North Carolina. 1973-80: Professor, Department of Chemistry •University of North Carolina. 1973-80: Associate Professor, Department of Chemistry •University of North Carolina. 1973-80: Assistant Professor, Department of Chemistry •University of North Carolina. Achyuthan K. A., Lu L., Lopez G. P., Whitten D. G., Supramolecular Photochemical Self-Assemblies for Fluorescence “turn on” and “turn off” Assays for Chem-Bio Helices, Photochem. Photobiol. Sci. 2006, 5, 859-868. Whitten D. G., Kim O.-K., Lopez, G. P., Achyuthan, K. E. Cooperative Self-Assembly of Cyanines on Carboxymethylamylose and other Anionic Scaffolds, Pure Appl. Chem. 2006, 78, 2313-2323. Zeineldin R., Piyasena M. E., Bergstedt T. S., Sklar L. A., Whitten D., Lopez G. P. “Superquenching as a Detector for Microsphere-Based Flow Cytometric Assays” Cytometry, Part A, 2006, 69A, 335-341. Kim O.-K., Je J., Jernigan G., Buckley L., Whitten D. Super-Helix Formation Induced by Cyanine J-Aggregates onto Random-Coil Carboxymethyl Amylose as Template, J. Am. Chem. Soc. ; 2006; 128(2); 510-516. Rininsland F., Xia W., Wittenberg S., Shi X., Stankewicz C., Achyuthan K., McBranch D., Whitten D. “Metal Ion Mediated Polymer Superquenching for Highly Sensitive Detection of Kinase and Phosphatase Activities” Proceedings Natl. Acad. Sci. US, 2004, 101 (43), 15295-15300..
Kumaraswamy S., Bergstedt T., Shi X., Rininsland F., Kushon S., Xia W., Ley K., Achyuthan K., McBranch D., Whitten D., Fluorescent Conjugated Polymer Superquenching Facilitates Highly Sensitive Detection of Proteases” Proceedings Natl. Acad. Sci. US, 2004, 101 (20), 7511-7515. Kushon Stuart A., Bradford Kirsten, Marin Violeta, Suhrada Chris, Armitage Bruce A., McBranch Duncan, Whitten David. Detection of Single Nucleotide Mismatches via Fluorescent Polymer Superquenching., Langmuir (2003), 19(16), 6456-6464. Kushon S. A., Ley K. D., Bradford K., Jones R. M., McBranch D., Whitten D. Detection of DNA Hybridization via Fluorescent Polymer Superquenching, Langmuir (2002), 18(20), 7245-7249. Lucia L. A., Yui T., Sasai R., Takagi S., Takagi K., Yoshida H., Whitten D. G., Inoue, H. “Enhanced aggregation behavior of antimony (V) porphyrins in polyfluorinated surfactant/clay hybrid microenvironment” J. Phys. Chem. B 2003, 107, 3789-3797.